After walking away victorious from the Boots Beauty Insiders Awards with the cup for Best New Haircare/Styling/Colouring product, Ojon Restorative Hair Treatment has come to be considered as the holy grail of haircare. This hair rejuvenator helps to hydrate and improve the condition of dry hair, something which many a lady (and gent) are plagued with over the drying winter months. Clinical tests showed a 52% improvement in the condition of very dry, damaged hair after just one use with 64% seeing an even bigger improvement when left overnight. The rejuvenators key ingredient is a very high concentration of Orjon oil, which is what hydrates the hair leaving it soft, silky, shiny and manageable but minus the heavy residue of many other hair conditioning products. 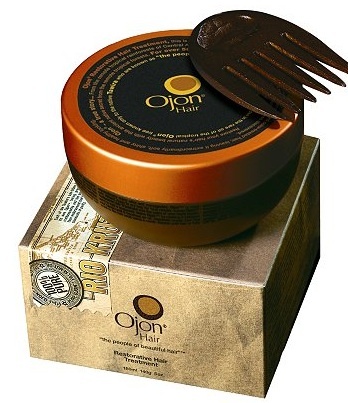 Ojon recommend leaving this product in for 20 minutes for a moisture injection or for really parched hair leave overnight. We know with Christmas coming up you are going to want to start stashing the cash but if you are going to treat yourself to one little indulgence this month then let it be this. After all, you can’t put a price on gorgeous hair!